Tari Topeng Monyet or Monkey Masked Dance is a very popular street dance in Jakarta, Indonesia, although it's very rare these days to be able to be found. 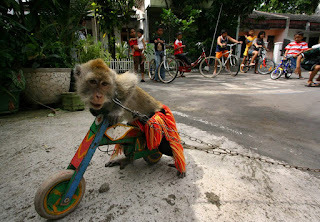 This happens because there is a ban on the Jakarta Government to exploit the monkeys to be "singers". The aim is to protect monkeys from commercial action detrimental to the welfare and happiness of monkeys. Let's watch this documentary video. This ban occurred since Jokowi become governor of Jakarta, Jokowi and now is president of Indonesia. Ahok has replaced Jokowi as governor, but the monkey mask dance was forbidden to be shown in the streets of Jakarta. Perhaps you can still see this dance in other areas such as Bekasi or Tangerang, which is not far from Jakarta.